How long before you receive your purchase? Most items are dispatched same day or within 24 working hours. Delivery time will depend on your location, most items will be delivered with 1-3 days to most areas and 3-7 days nationwide. For further contact details please see our Contact Us page. What happens if you haven't receive your product? 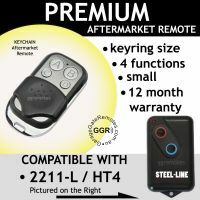 Please by all mean browse Garage Gate Remotes complete range of more than 70 products and services at www.garagegateremotes.com.au.